This is an armadillo. This insect-eating mammal is native to South America and has spread through the southern United States. Unlike most insectivores, the armadillo has teeth-rootless pegs set far back in its mouth. These teeth allow it to supplement its diet of ter mites, scorpions and other insects with snakes, poultry, fruit, and eggs. 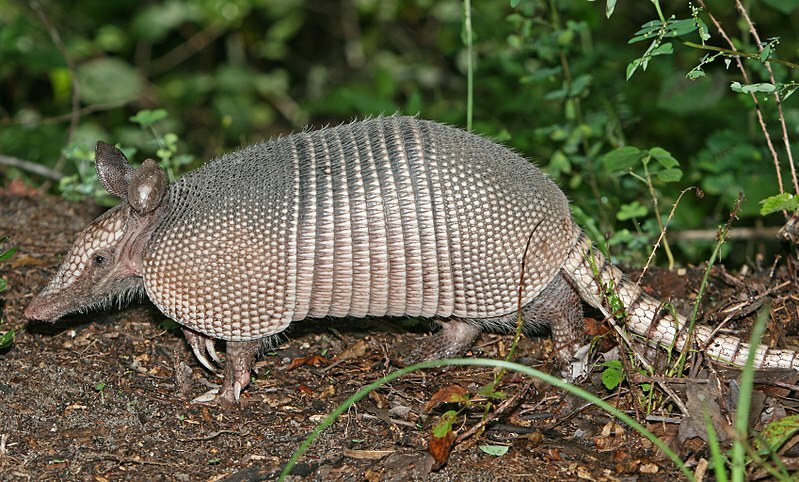 The armadillo's name, "little armored thing," was given to it by the Spanish when they invaded the New World. This "armor" is an outer layer consisting of numerous bony plates with a horny covering. This shell is hinged at the mid dle of the back, allowing the front and hind sections freedom of movement. In some species, this covering extends o ver the face and tail as well as the torso and limbs. Armadillos range in size from the great armadillo, at 5 feet in length, to the fairy armadillo at 5 inches. The mos t common of the armadillos, the 9-banded armadillo, is about the size of a house cat.